It has to be a splash---just a splash---of bourbon, and it has to be that fresh-pressed apple juice that's all thick and fancy and tastes like an English autumn. Sometimes I get crazy and fill the top of the glass up with ginger ale or (even better) ginger beer. I once had this drink in a very cool bar in New York so now I basically like to pretend that I invented it. Funny you should mention that because, truth be told, *I* invented that drink. I call it a Kevin Jones. Though I'm willing to stretch my copyright a bit to include yours, since mine has a squeeze of lemon in it (and a bit of chopped apple in the bottom if you're feeling fancy). Yum. I love fresh pressed apple juice and I may just have to give this a try. You said you were just drinking the cider when you were gardening...at what point in the day did the bourbon sneak in!? Man, that sounds good. Too bad it's full of stuff I'm not allowed! :( Have a few for me! This is also tremendously good after a day of snowboarding (and made much better if the bartender warms up the apple juice or cider first). I highly recommend it. 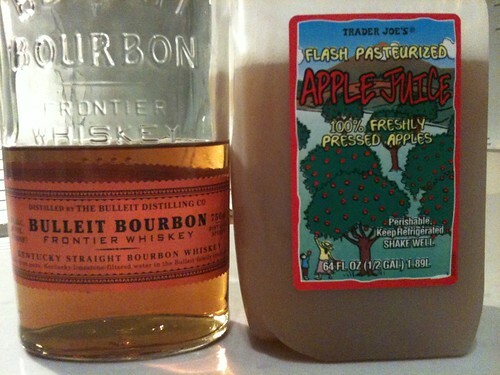 Eh...I'm not a fan of bourbon, but I love apple cider. Maybe I'm make my husband try it first for me. Love the label on the bottle of bourbon though! My fiance enjoys trying to find/create a "house cocktail" for us for each season, and our fall one was a Maple Leaf. It's essentially a bit of bourbon with a splash of maple syrup, and then topped up with club soda or ginger beer, with a squeeze of lemon over it all. It's really delicious - if you like this bourbon and cider mix I think you'd love it. This makes so much sense. Thank you, God, for inventing bourbon. I read the title of this post, glanced at the photo and immediately thought to myself "YES! I trust her judgment implicitly!" This drink sounds delightful. If we're recommending drinks centered around apples and cider, might I recommend the "Hard Applesauce". Take a nice tall glass of hard cider and add a shot each of apple schnapps and cinnamon schnapps. MMMmmm... delicious! I have not tried bourbon and cider with ginger ale! That's genius. Might I suggest trying Buffalo Trace bourbon. Bulleit is good, I'll definitely give you that, but Buffalo Trace is OMG good. Yum. Where I come from (the midwest) we drink our fresh pressed cider hot with brandy. Am going to have to try this and also try the Hard Applesauce mentioned, oh yeah. I am all over this - in the winter I even sometimes will heat the cider first. Oh goodness. Also? Those Bulleit bottles make THE BEST water bottles when you are finished with the tasty bourbon.